I can still hear Sheila's voice in my head. "I'll ride with David any day!" She would say, and it's not just because he's handsome and fun, or because he rides a nice horse. It's because he likes to go off trail. He likes to explore and look for challenging places. I call these rides the "Dave Thompson adventure rides." You can't be a wimp if you ride with David. Our intent was to go to the Fourth of July trail head, a trail we'd been to when we first came to Idaho, thirteen years ago, and haven't been to since. Twelve miles of STEEP winding dirt road, we found the trail head so packed with cars that we were barely able to snake through with the truck and trailer. Since there was no place even for a small car to park, we made our way back down to highway 75, and drove to an area that does not have any trails, or people. The headwaters of the Salmon river begins as a tiny stream at a high meadow between the Sawtooth Valley and the Big Smokey Valley. It tumbles down a canyon and into this area where we parked and unloaded Roy and Arizona into the sagebrush. Arizona seemed to be fussy after that long dusty bumpy trip in the trailer, not quite his cheerful self. We saddled and started off heading southwest through the sagebrush. Acres of delicate white mountain lilies lay interspersed with the sage and pines. Ahead of us and to our left, I saw a huge herd of pronghorn fleeing from us, even though we were about a half a mile away. They floated across the prarie like an apparition. Beyond them on a hillside David spotted an elk. About five minutes later the herd was circling back to where they started, now to the right of us. Arizona didn't care much about them. David was heading toward some thick willows. "Hey, we could just go straight ahead here in the wide open for about five miles might be a good idea." I said. I wanted Arizona a little more relaxed before asking him to try anything that might require some try. "Oh, okay." 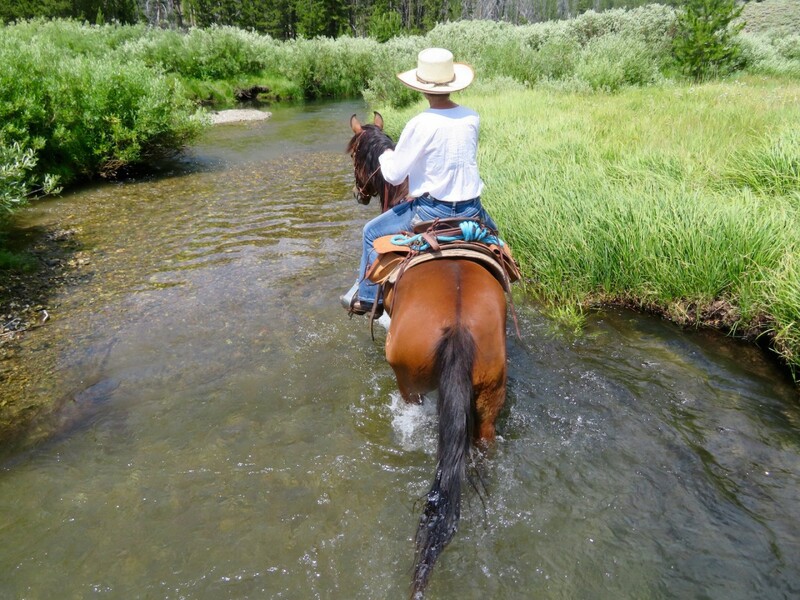 We came across a little creek crossing, where both horses got their fill of cold fresh water, and eventually found our way in and out and through some tall thick willows. We went into dense aspen forest and areas covered with downed pine trees. He had to really think about how to get around what looked like giant pick up sticks and stepping over some fairly large logs. Now and then we'd get back out onto the road, which was where Arizona was the most comfortable. It's a little work out there with thick sagebrush, rocks, muddy places, and downfall. The road was a good pause for him. He had returned to his normal relaxed attitude, as we found our way down to the river. We crossed a number of narrow crossings first, then we headed to the main flow. We followed Roy in and out a couple of times, then followed him upstream, with the cold water rushing over their legs. As we walked ahead, the floor of the creek rose and fell, making some pretty deep pools. The first time he got in belly deep he hesitated, then realized he had to push hard through the resistance of the deep water. The sound of the water hitting his legs and chest and splashing around him got his attention, but since Roy was okay with it, so was he. We walked up a ways, then stopped, slipped on their halters so they could graze while we had our lunch. We got back on and retraced our steps, this time with Arizona in the lead. He was very focused and was giving me all he had and was being very brave. Wandering back through the sage and the forest, David spied something, maybe an abandoned road, across the river from where we were. "Let's go over there!" he said, pointing his finger (looking like Lewis or Clark). I thought that Arizona had worked really hard for me already, but we'd only been out for about two hours, and he'd barely gotten sweaty, and he's such an agreeable guy, so I said yes. We found a place that looked like we might be able to cross, so David helped Roy pick his way down a little step to a ledge, and then they plonked down into knee deep water. Even Roy hesitated at this place, it was a bit technical. I was not too sure if Arizona could figure it out, but decided to give it a go. Arizona did just what I asked, placing his feet just where I asked, and then plopped right in to the right of Roy's hip. The water was deeper than he'd expected and he jumped up into the air and landed just to the left of Roy's hip. Made me laugh out loud. Then he stood there, no doubt seeing how relaxed Roy was. Exploring the other side of the river, the skies were turning dark. The slight breeze every now and again would shift into a blast of wind, about 40mph and then quiet again. As we dropped down onto a steep slope going down to the river, one of these blasts hit us again, blowing my hat off my head (stampede string saved me from having to go retrieve it). Roy had shuffled off ahead of us and here is where Arizona reached his limit. Light on his feet and shaking his head, he let me know that he didn't have much left to give me, he was done. It was just a bubble though, and after dancing down the slope we went on. After we crossed the river one last time, and were topping the last hill before our trailer came back into view, I heard an unfamiliar sound. "Did you hear that, David?" "Yes, what was that?" We heard it again but closer this time. We looked up and saw just over our heads, two trumpeter swans, heavy in the air, flapping their wings and honking above us, flying north. 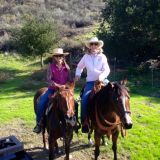 At the trailer, we shed our saddles, put their halters on and let them graze a while before the first drops of rain started to fall.